Before the Campbells’ house was turned into the Campbell House Museum, all the objects in the house (except for the estate jewelry) were sold at an Ivey-Selkirk (then called “Ben J. Selkirk & Sons”) auction. The museum foundation was able to purchase most of the Campbell pieces, but many objects were sold to private individuals. 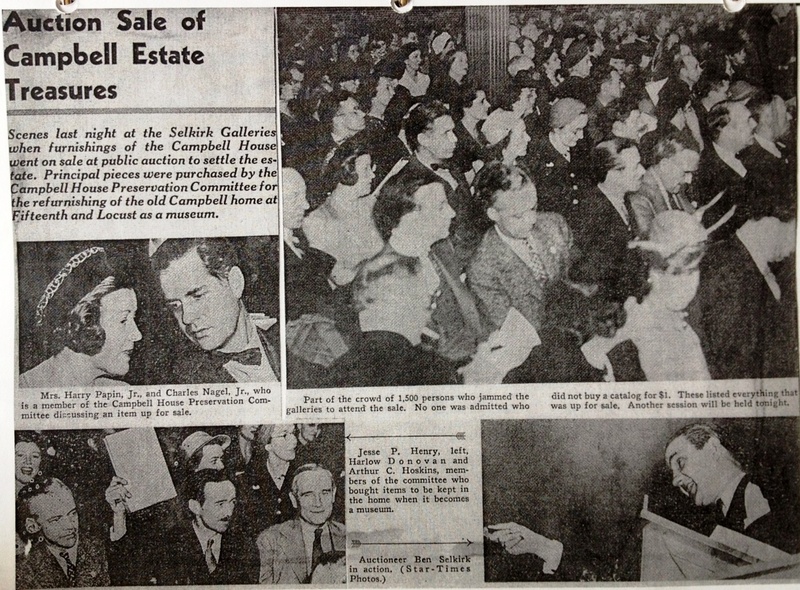 To the right is one of the many pages of the auction’s newspaper coverage in 1941. Fortunately, when people learn they have a piece that came from the Campbell auction, they very often give it back to us, and this seems to happen at least once a year. In January 2012, these sterling goblets were returned by a local family. 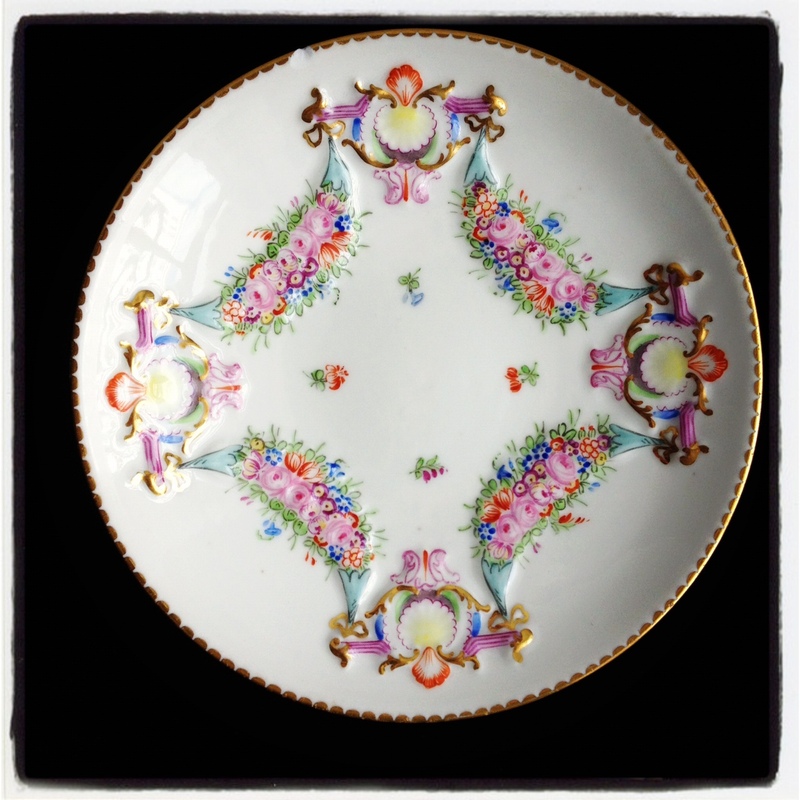 Yesterday, we received two beautiful pieces of china. 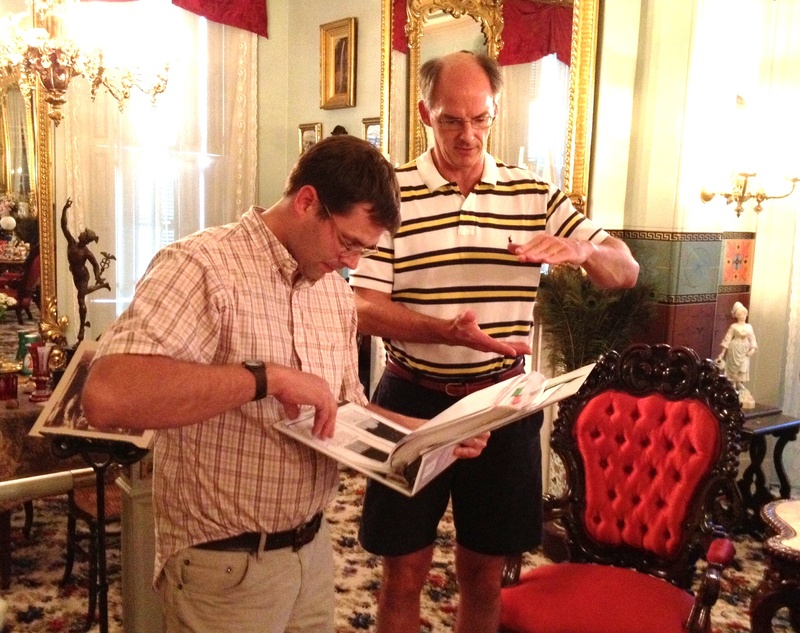 Executive Director Andy and Jay going through the Selkirk’s auction catalog to find the description of the plate and cup. Jay Smith’s aunt gave him a cup and plate as a gift, and she told him it was from the Campbell auction. 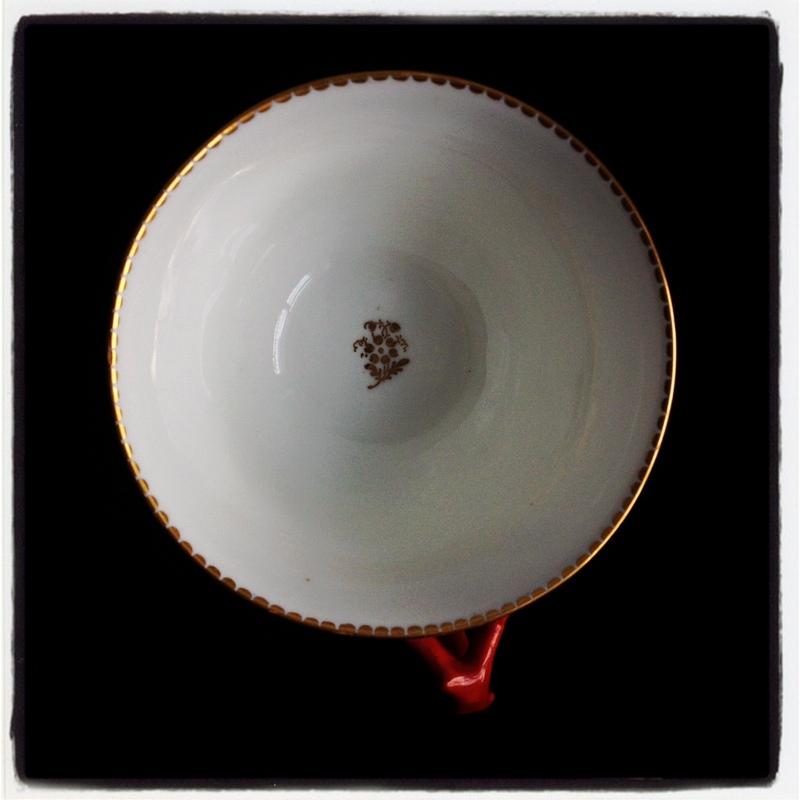 Jay came through the house a few weeks ago on a tour, all the while looking for a piece that matched his cup or plate. He arrived shortly after a tour started, so he didn’t get to see the Parlor until the very end. As he walked through the house, he was beginning to doubt his aunt’s story. Finally in the Parlor, he saw a matching plate. His aunt was right! We were delighted he offered to donate them to us. He stopped by yesterday, and he brought the plate and cup. 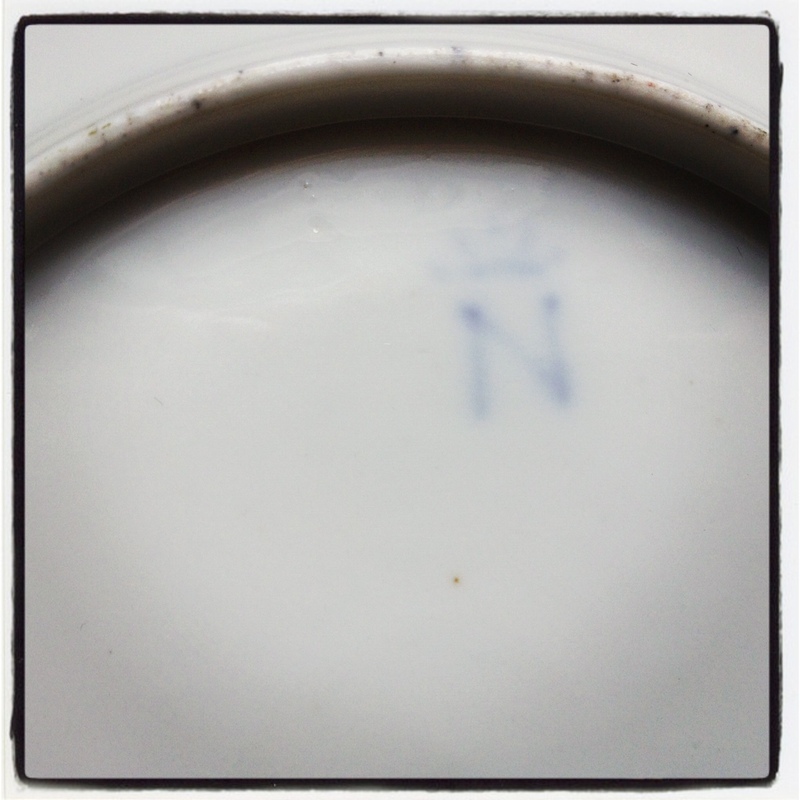 Though not a matching set, each one is marked with a blue crown sitting on top of a capital “N.” The Selkirk auction catalog call the pieces “Capo di Monte Cups and Plates.” Over the years, Capo di Monte porcelain has been manufactured in Italy and Spain, and it is notable because of its intricate figurines. 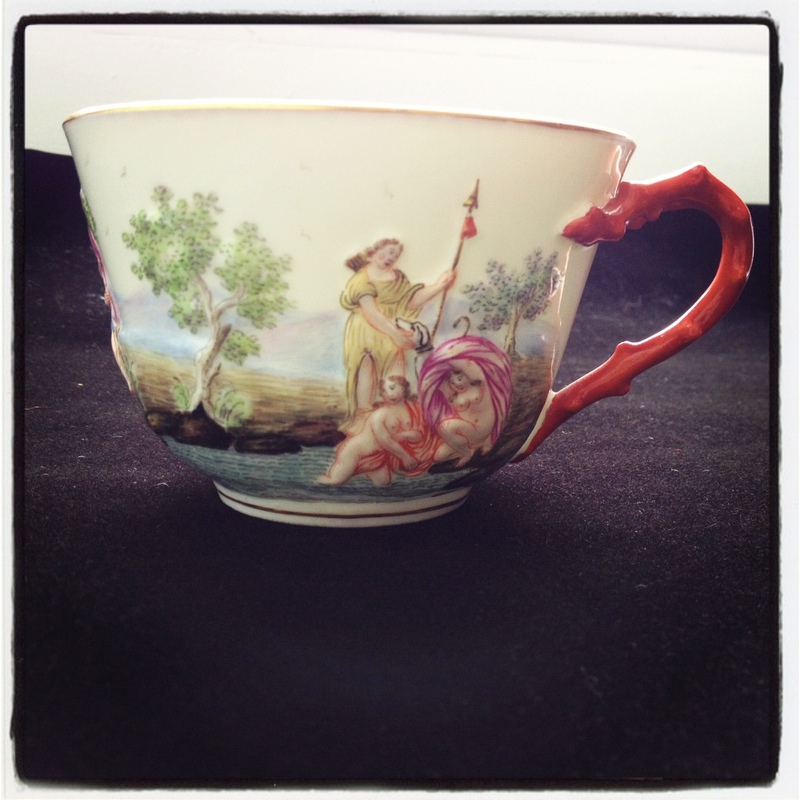 The style of the mark on these pieces indicates it was produced in Naples, Italy between 1771 and 1834. Capo di Monte (now often spelled “Capodimonte”) is still produced by Majello. The plate, and it measures about 7-1/4″ across. The cup. Note the intricate detail and textured “wood” handle. The gold decoration on the inside of the cup. 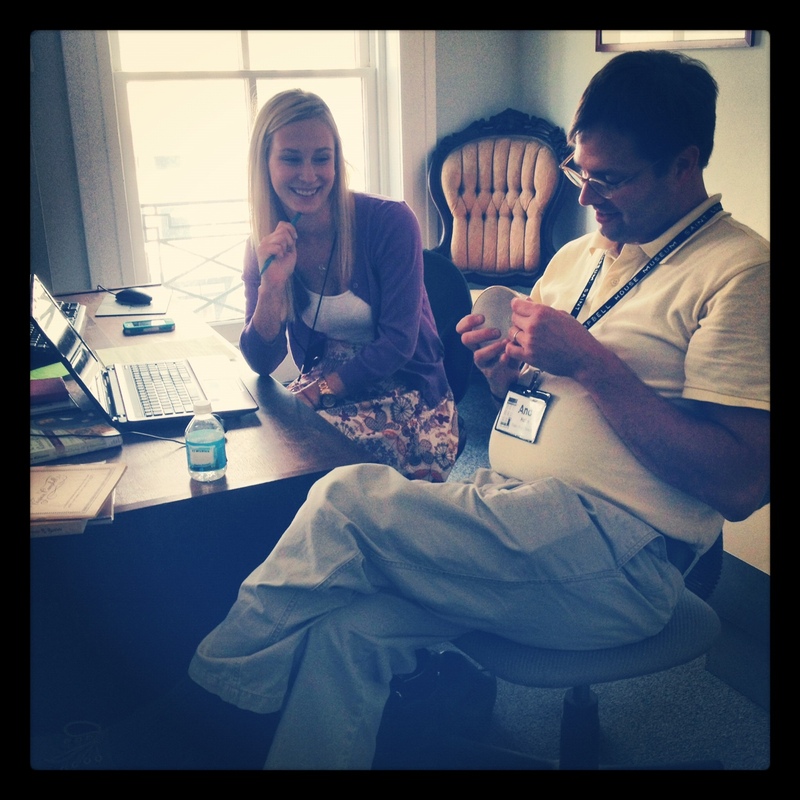 Intern Amy and Andy discussing the the cup while they researched the “Capo di Monte” stamp. Next, we’ll accession the pieces and you can read about that process here. After that’s done, we’ll put them on display somewhere in the Museum, probably in the parlor near the other matching pieces. Be sure to come by to see them in their new (sort of) home!